This is definitely the winter of our discontent — and who knows what the summer will bring? Certainly not France’s would-be sun, President Macron, who seems beleaguered rather than Jupiterian. The ambitious young president who was supposed to blow a breath of fresh air through the corridors of power has taken everyone’s breath away by his careless reaction to Alexandre Benalla, a young, swiftly promoted bodyguard and aide who created a scandal in Paris last May by donning a police helmet and attacking demonstrators. He was dismissed in July, and has now been caught using his diplomatic passport to travel to Chad a fortnight before the French President’s visit. 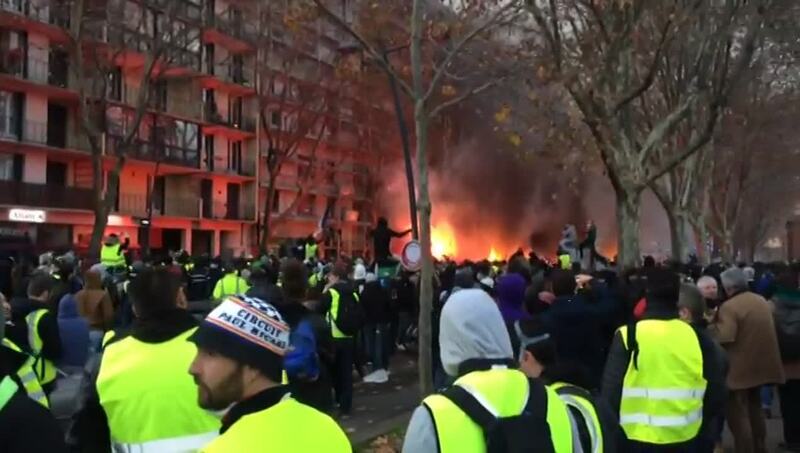 All this on top of the Gilets Jaunes, or Yellow Vests, who have been showing their discontent rather violently, mainly on Saturdays, for over eight weeks now. At first it was because of rising diesel prices — tough in a country where there is little public transport outside the main cities — but that turned out to be simply the last straw. Now it seems to have become a leaderless protest demanding help and understanding from the remote powers that be, throughout a country where things are gradually getting worse for the middle class. However it has gone on for too long and the violence is alienating many supporters. There are going to be some fabulous exhibitions in Paris this year, ranging from Japanese buddhas from Nara and Tutankhamun’s treasures which will never leave Egypt again to Toulouse-Lautrec and Dora Maar retrospectives, Picasso at war, and Vasarely’s foundations for Op Art. Over a hundred pieces from London’s Courtauld Collection will be shown at the Louis Vuitton Foundation but, even more exciting, there will be a 500th anniversary tribute to Leonardo da Vinci in the Louvre at the end of the year. Will it have the Salvator Mundi that Christie’s auctioned for US$450 million in 2017 and which has not been seen since? The weather is foggy and humid and not good for my hair, although there have been just a few deep red sunsets and bright, starry night skies recently, followed by crisp, frosty mornings when I’ve walked the six dogs over crunchy grass. The vines have been pruned and tied and unseen wild boar have ‘ploughed’ great patches of land near them. The winter jasmine is in flower, and one or two confused early primroses. To my surprise and delight, a V-formation of cranes flew south honking and cackling overhead on New Year’s Day. It’s all comfort food at this time of year and I have two new dishes. The first is a quickly made quiche from my friend Sheila Marks, which is three eggs, 300gm of any strong grated cheeses, a teaspoon of mustard and 300ml of cream mixed and poured into a baking dish lined with puff pastry. Cook at about 200° for about 20 minutes till golden. That has been a real lifesaver. And the second is a confit of clementines or tangerines, now in season, which everyone but me watched being made on television the other day and has been making ever since. You halve seedless, unpeeled clementines horizontally and cover them in cold water and sugar, which you bring to a boil. That takes 20 to 30 minutes, and then you put them in sterilised jars covered in the liquid for a week or two or for as long as you can restrain yourself. They are delicious with sorbet or ice cream — even yogurt. And you can make a killer cocktail with the juice shaken with rum and Cointreau. Interesting that no one seems to know whether Australia is going to buy a new generation of submarines from France or from Japan… but we are watching with curiosity. Clare lives in France and is proficient at French-English-French translations. She has diverse experience in proof-reading, editing, letter writing, clippings service and itineraries.